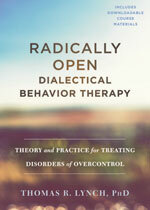 If you subscribe to our mailing list, Radically Open Ltd (registered company 9333062) will send you regular updates about upcoming training events and new publications about RO DBT such as blogs or scientific papers. We try to keep our mailings to a minimum, and typically you will not receive more than 2 or 3 emails per month from us. We will never share your details with another company unless we have asked and received your explicit permission for this. Your details are saved on a website called MailChimp, a company that is also committed to protect your privacy and that complies with the General Data Protection Regulation. We will keep your data on our mailing list for as long as you subscribe to it. You can view and update the information we have about you via a link we send you at the bottom of all of our emails. You can change your mind at any time by clicking the unsubscribe link in the footer of any email you receive from us, or by contacting us at roelie@radicallyopen.net. We will treat your information with respect. For more information about our privacy practices please visit our website. By clicking below, you agree that we may process your information in accordance with these terms.